Hatchet Bay was more secure than we imagined. Then we moved down Rock Sound. At this point we started getting acquainted with other cruisers going the same way. for Little San Salvador where Holland America Lines has a Potemkin Village. It was rolly, so we tried a side bridle to the anchor chain to set the stern into the waves, with moderate success. It was a wild ride over to Cat Island, finally we were exposed to ocean swells and wind. On Valentine's Day, we tucked in wee Fernandez Bay in front of a small resort. We had a nice but very expensive dinner ashore. The real fun was meeting the other guests from France and Switzerland. We had a great time. 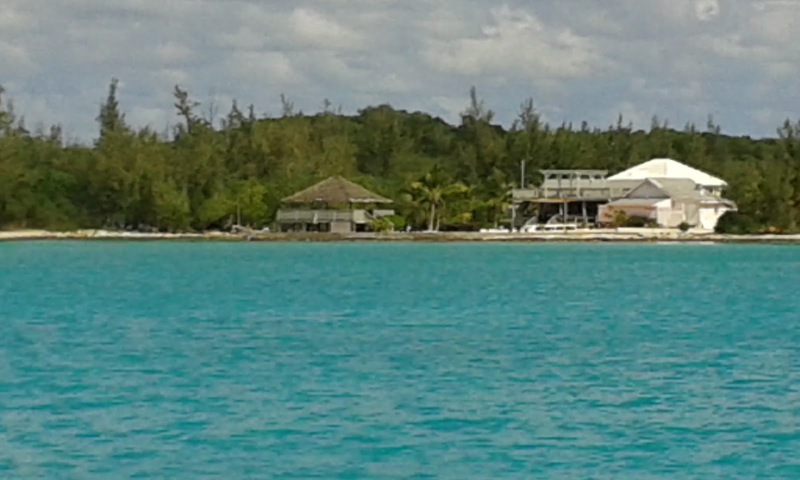 Fernandez Bay is open to the south and west, so coming wind changes pushed us onwards to the Exumas. Soldier Cay was lovely, but the weather changes every few days, and the protection at Soldier Cay was limited. So we set out for New Providence Island, just east of Nassau. For a change, this took us out over deep waters. Nassau has a good port, but is a busy city that doesn't interest us. So we found an anchorage just east. As we approached, the wind strengthened a lot, but we nipped in the pass in time to find our way through the shallows to a safe spot for the night. 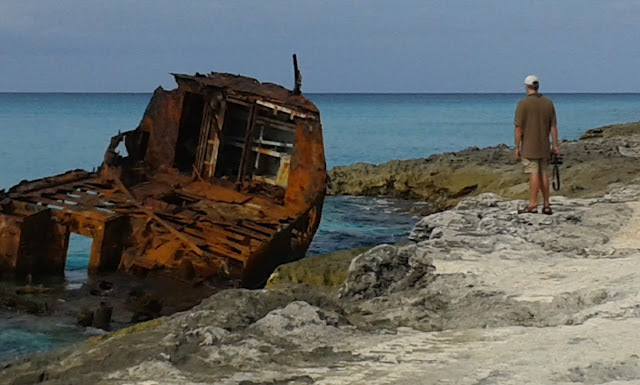 The next day, we set sail again eastward to the big island of Eleuthera and well protected Hatchet Bay. It's unusual for the Bahamas, as it's almost completely surrounded by high limestone banks with a narrow opening. All day we sailed over 10-20 ft depths, which is mind boggling to us, since the boat needs 7ft of water. After a really windy start, the wind died completely to a glassy calm. The water is so clear it was like motoring across a giant swimming pool. We could see starfish on the bottom as we passed. Lighthouse Point FL - During a quick visit that stretched out almost a week, Linda and Bill Bowers spoiled us with generous hospitality. We shared the pain (sort of) of the Patriots' loss to the Panthers last Sunday. It rained buckets for a couple days, so at least the boat was clean for a while. Bill, Linda and their friends helped us in many ways. We so appreciate everything they did for us. We managed to nip into Brown's Marina just in time to clear Customs and Immigration before closing that evening. To celebrate, we had dinner at the Big Game Club resort that night. One of the other patrons in the restaurant was wearing a UW Huskies sweatshirt, so we struck up a conversation. He turned out to be Tim Kenny, brother of our neighbor Shannon back in Seattle. He was aboard his new sportfishing boat at the same marina with a niece and nephew. He is a fun guy and we had a good time talking on the dock for a couple days until we left. Bimini's high season is summer, so some businesses were closed and it wasn't very busy and it was easy to stick around another night. But finally (again) we shoved off for the Berry Islands 90 n miles east across the shallow waters at the north end of the Grand Bahama bank. Winds were light so we motored for the 10 hour crossing, some of it was in darkness with brilliant stars overhead. Most of the depths are 10-15 feet, which can be nerve wracking. But after many hours, you get used to it and don't run aground, it's OK.
At 2230 (10:30pm), we anchored in the calm waters of Hawks Nest Bay on Great Harbor Cay. The next morning we woke to beautiful sunshine and balmy breezes. The bay is quite open, so we moved a few miles south to Market Fish and Soldier Cays and anchored in 10 ft of turquoise water with an ivory, sandy beach on shore under sunny skies and starry nights. After 2 nights, the only other people we've seen are a couple lobster fishermen who came by to sell us a gigantic lobster tale. It was a cruiser's dream to have the place to ourselves for 4 days. But, dear friends and family, we wish you could be here to share it with us. That would truly make it perfect. Except, we'd have to wear swimsuits again. But it would be worth it.